I was delighted to participate in the Bookaroo Children's Literature Festival in Kuching in April 2016. For those of you who have never heard of Bookaroo, this is the children's literature festival organised by the Bookaroo Trust, the brainchild of the intrepid duo from India - Swati Roy and Venkatesh M Swamy. I was told that it first started in the city of Delhi in 2012 and then spread to other cities in India, including Pune, Goa, Ahmedabad and most recently, Jaipur. In 2015, Bookaroo was held outside India for the first time - in the city of Kuching, the capital of Sarawak, a Malaysian state on the island of Borneo. This was made possible by sponsorship from the Sarawak State Library also known as Pustaka Sarawak. 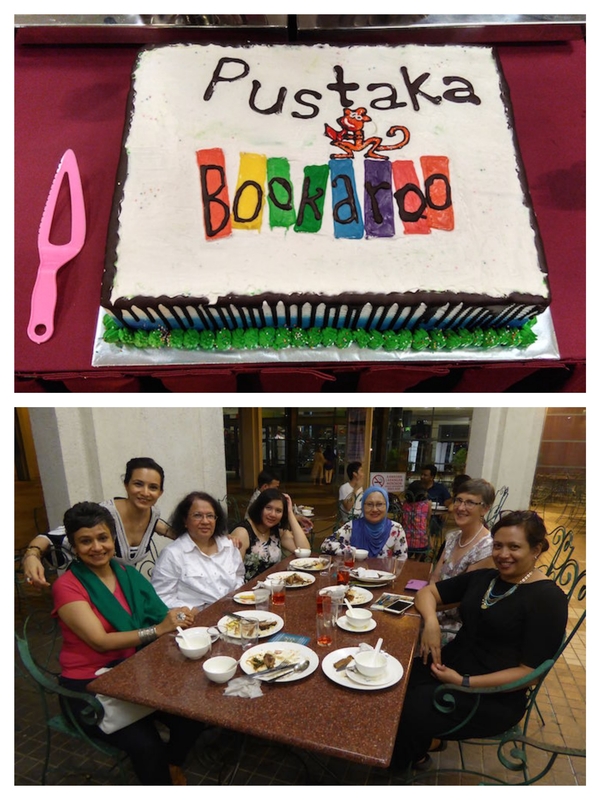 I believe the energetic Jo Williams had a hand in bringing Bookaroo to Kuching. The festival was held, with even greater success, for the second time in Kuching in 2016. My memories of the Pustaka Bookaroo in Kuching are reflected in these photos. Apart from the festival itself (and the children, the books, the writers and illustrators! ), I was impressed by the city of Kuching, the leisurely pace of life, the green spaces, and the amazing library which served as the venue. Kamini having a chat with Swati. This event also gave me the chance to listen to Pranab Mukherjee, one of the foremost spoken-word poets from Kolkata, India. This is Pranab the poet and storyteller and not the Honorable President of India! I was astonished to find out that Tagore had written a poem about this part of the world: Malaysia, Java and Bali. Pranab's rendition of Tagore's poem had us all spellbound, including Shona, who actually asked me who Tagore was! The other participants were: Kamini Ramachandran, story-teller extraordinaire from Malaysia but now residing in Singapore, David Liew, popular Singaporean illustrator known for the Squirky series of books, Emma Nicholson, author and publisher, also residing in Singapore, Heidi Shamsuddin, a Malaysian author known for her 'Doorway Under the Stairs' series, Lim Lay Khoon, a Malaysian illustrator who frequently collaborates with Heidi, Valentina Triverdi, a well-known story-teller from New Delhi, India and Tom and Frane McLaughlin from Australia. 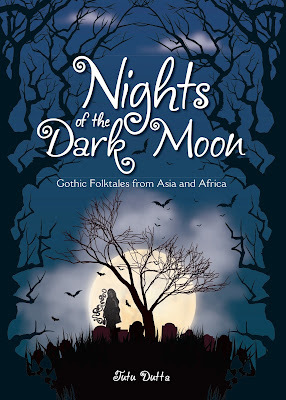 Others were, Nor Azah Ishak, a Malaysian author and illustrator, and two award-winning Malaysian story-tellers and authors, Mahaya Mohd Yassin and Hasniah Mamatok. Last but not least, there is the talented young story-teller, Urmi Dasgupta, who came to Bookaroo Kuching with her parents. An important component of Bookaroo is 'Bookaroo in the City.' In this programme, writers and illustrators visit schools in the city to interact directly with children in schools. David Liew came a week before most of us to undertake school visits with great success. Apparently, he made his 'Squirky the Alien' (written by Melanie Lee) books a hit in Kuching. The Grand Finale was a party on the terrace outside the library which had a view of the library's garden and a serene lake. The food and especially the dessert of Sarawak-style chendol was scrumptious. This wonderful event was hosted by Pustaka Sarawak. Valentin, Kamini, Tutu, Shona, Rashidah, Emma and Heidi. Rashidah Bolhassan, the CEO of Pustaka Sarawak with Urmi Dasgupta. I stayed on an extra day to experience Bookaroo in the City. I was assigned a reading at SK Tabuan in Kuching. Apparently, this is a trust school i.e. schools which have expatriate teachers, to give additional coaching. I had three groups of students read out the parts from a play I wrote, based on Princess Tupai (Princess Squirrel) one of the folktales from Timeless Tales of Malaysia. I learnt something from this experience - never underestimate the power of free gifts! On the trip to the school, I shared an SUV with Tom McLaughlin and Pranab. Tom told us about his upcoming book, about an Aboriginal legend and also the sad history of these people in Australia. Pranab visited the War Museum on the same day and took pictures of a ramshackle POW barrack known as the Punjabi Barrack, for his upcoming book. Front row: Venkitesh, Jo and Pranab; followed by Tom, Mas and Rashidah. Many thanks to the organisers, Swati Roy, Jo Williams, Venkatesh M Swamy and the State Library of Sarawak. I'm also indebted to the local children's literature community and supporters: Yitping Tay, Grace Rongrong, Melinda Siew, Mas Andika Puteri and Rahim Bugo. whose daughter bought a copy of Phoenix Song!